White House insiders say Salazar has fallen out of favor and speculate that he will be gone after November’s midterms. Obama didn’t say directly whether Salazar would still have a job, but he acknowledged the overhaul of the former Minerals Management Service — long accused of being too cozy with the oil and gas companies it regulated — took too long. It’s not just the MMS that’s been a disgrace under Salazar’s Interior, the US Fish and Wildlife Service, Bureau of Land Management,and other agencies at Interior are all failing the American public, effectively liquidating America’s environmental heritage to appease the very industries that ran the Department under the Bush Administration. Interior: same contractors doing their NEPA on behalf of the same industries … if it smells like Bush and tastes like Bush … we’re supposed to call it “Change” ? Scientists: Wolf Hunts More Deadly Than Previously Thought. By Virginia Morell. Science Insider. Link is now fixed! Department of Ecology, Montana State University, Bozeman, Montana. We have been discussing this all day under another thread, but it is important to post this story. It’s unreasonable to except that there won’t be future wolf hunts in the Northern Rockies, despite the current count imposed relisting of the gray wolf. However, this article demonstrates that Montana and Idaho’s wolf hunting plants for 2010 (which would have already been underway) would have significantly reduced the wolf population. Idaho was honest about their intention to reduce the population. Montana argued that a hunt of that size was needed merely to keep the current population from growing, and that was about all it would really do. A new study in the Journal of Wildlife Diseases confirms, unequivocally, that the domestic sheep disease Mannheimia haemolytica kills bighorn sheep after the two species co-mingle. This paper has been rumored for the last several months and was cited in the recent Payette National Forest decision to close 60% of sheep grazing allotments on the Forest. Surely this should end the discussion among reasonable people about whether science supports the notion that domestic sheep and bighorn sheep can co-exsist. They cannot and actions must be taken by Federal and State agencies to make sure that the two species do not overlap on the landscape. 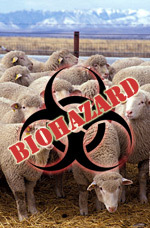 ABSTRACT: Previous studies demonstrated that bighorn sheep (Ovis canadensis) died of pneumonia when commingled with domestic sheep (Ovis aries) but did not conclusively prove that the responsible pathogens were transmitted from domestic to bighorn sheep. The objective of this study was to determine, unambiguously, whether Mannheimia haemolytica can be transmitted from domestic to bighorn sheep when they commingle. Four isolates of M. haemolytica were obtained from the pharynx of two of four domestic sheep and tagged with a plasmid carrying the genes for green fluorescent protein (GFP) and ampicillin resistance (APR). Four domestic sheep, colonized with the tagged bacteria, were kept about 10 m apart from four bighorn sheep for 1 mo with no clinical signs of pneumonia observed in the bighorn sheep during that period. The domestic and bighorn sheep were then allowed to have fence-line contact for 2 mo. During that period, three bighorn sheep acquired the tagged bacteria from the domestic sheep. At the end of the 2 mo of fence-line contact, the animals were allowed to commingle. All four bighorn sheep died 2 days to 9 days following commingling. The lungs from all four bighorn sheep showed gross and histopathologic lesions characteristic of M. haemolytica pneumonia. Tagged M. haemolytica were isolated from all four bighorn sheep, as confirmed by growth in ampicillin-containing culture medium, PCR-amplification of genes encoding GFP and ApR, and immunofluorescent staining of GFP. These results unequivocally demonstrate transmission of M. haemolytica from domestic to bighorn sheep, resulting in pneumonia and death of bighorn sheep. via TRANSMISSION OF MANNHEIMIA HAEMOLYTICA FROM DOMESTIC SHEEP (OVIS ARIES) TO BIGHORN SHEEP (OVIS CANADENSIS): UNEQUIVOCAL DEMONSTRATION WITH GREEN FLUORESCENT PROTEIN-TAGGED ORGANISMS — Lawrence et al. 46 (3): 706 — Journal of Wildlife Diseases. Although most of the grass roots activity against wolves has come from elk and deer hunters, it has always been the ranchers at the core of wolf hatred. The reason is that the large ranchers have always believed it is their right to govern the rest of us. The were very insulted when something like wolf reintroduction happened over their objections . . . makes them think they are losing their grip. We certainly see it in Montana. Max Baucus has always been a prime example of man born to ranch privilege and power. Jon Tester is a rancher/farmer. The state’s lone Republican, House member Denny Rehberg is a rancher, and so is his Democratic opponent in the upcoming election. This issue has always been about the privilege and power of a tiny elite in the West. That’s what wolves are so controversial in the Northern Rockies, but not in Minnesota, Wisconsin or Michigan where social and economic justice has always been more important. I don’t know if this legislation will move or not, but I do know what it is not about. It’s not about wildlife or wolves. It’s clear now Congress won’t take this up before the elections. They want to go campaign. Temporary Spending Bill Passed: Congress Punts On Budget, Controversial Issues. Huffington Post. Baucus, Tester introduce bill to return wolf management to Montana. By Rob Chaney. Missoulian. Note that the bill doesn’t do anything regarding wolves in Wyoming. It is kind of a “damn you Wyoming” bill. I posted this at the end of August. It’s time to get your comments in. The Idaho Department of Fish and Game has released its Draft Bighorn Sheep Management Plan which essentially draws lines around existing bighorn sheep populations and prevents recovery to historical habitat. This is a big problem because the bighorn population has been in steep decline due to diseases spread by domestic sheep. 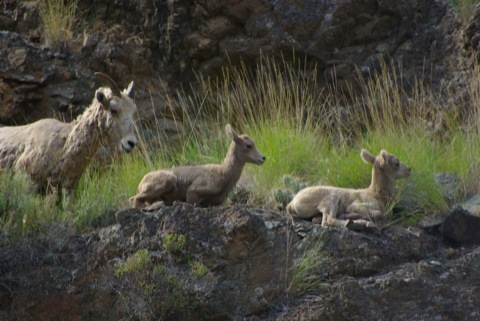 A population that recovered from over hunting and disease in the late 1800’s and early 1900’s started to increase after hunting regulations and reintroductions took place but the recovery was short lived and now the native and reintroduced populations have suffered from repeated contact with diseased domestic sheep and goats. The population numbered around 5000 in the 1990’s but is now about 2900 and continuing to decline. Two areas, the Pioneer Mountains west of Mackay, and the Palisades east of Idaho Falls, are areas where dispersing sheep are commonly seen. Under this plan these areas have been essentially written off due to the presence of Federal sheep grazing allotments. Another area that isn’t included as a priority area for sheep recovery is the Sawtooths and the Boise and Payette drainages. These areas contain very suitable habitat yet there are domestic sheep allotments there as well. The Management Plan is not likely to curb the declines in bighorn sheep populations and the IDFG is afraid to advocate for bighorn sheep conservation. They hold the power to really make the Federal agencies pay attention and close sheep grazing allotments but the IDFG is a captured agency that depends on the good graces of the livestock industry dominated legislature. 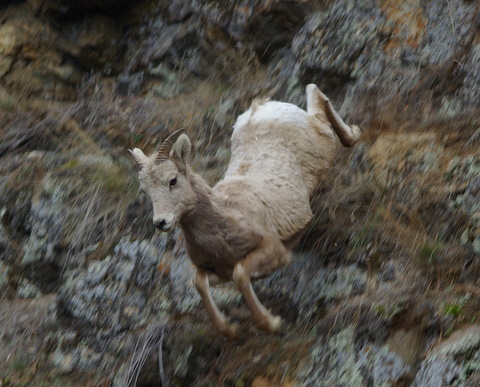 Comment on the Bighorn Sheep Management Plan. The Comment Period Ends September 30, 2010.